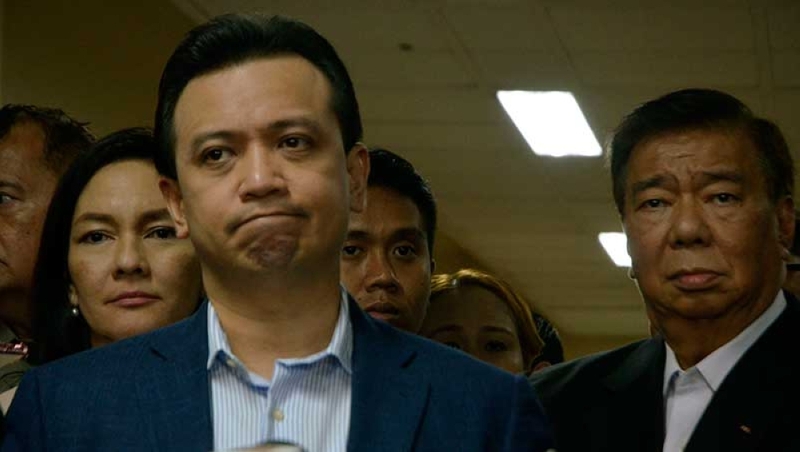 The Court of Appeals (CA) did not issue a temporary restraining order (TRO) that would stop the proceedings in the revived rebellion case against Sen. Antonio Trillanes IV in connection with the 2007 Manila Peninsula Hotel siege in Makati City. In a three-page resolution written by Associate Justice Apolinario D. Bruselas Jr., the CA said that even the Supreme Court (SC) did not issue any ancillary relief to Trillanes when he elevated the nullification of his amnesty through President Duterte’s Proclamation No. 572. It noted that the SC left to the trial courts the resolution of the factual issues on Trillanes’ petition. The CA also noted that while Branch 150 of the Makati City regional trial court (RTC) had issued a hold departure order and a warrant of arrest against Trillanes on the rebellion case, the senator has posted bail and is out on provisional liberty. “Given the foregoing state of facts, the ancillary remedies applied for may not be granted at this time without running afoul with the principle that provisional reliefs may not be granted in advance of the main action where the provisional relief is the very remedy prayed for in the complaint or petition,” the CA said. “We may not temporarily restrain or preliminarily enjoin the prosecution of the criminal action for rebellion at this stage because to do so would be to grant the principal prayer for certiorari, prohibition and/or injunction without the benefit of a hearing,” it also said. “Accordingly, the application for a temporary restraining order (TRO) or a writ of preliminary prohibitory injunction is denied at this time,” the CA ruled. Earlier, Judge Elmo Alameda of Makati City RTC Branch 150 had denied Trillanes’ motion to reconsider the reinstatement of his rebellion case. The denial prompted Trillanes to elevate the case before the CA. Judge Alameda stood pat on his findings in September last year that Trillanes failed to prove his compliance with the minimum requirement when he applied for amnesty during the previous administration. “Unfortunately, Sen. Trillanes failed to prove that the original of the alleged application form exists. Sen. Trillanes even failed to explain his failure to locate or find the copy thereof. On Trillanes’ coup d’etat case in connection with the 2003 Oakwood mutiny, Judge Andres Soriano of Makati City RTC Branch 148 had denied the DOJ’s plea to revive the case with a ruling that the case had already been dismissed and terminated. But Judge Soriano upheld the constitutionality of Proclamation No. 572 which voided Trillanes’ amnesty on both the coup d’etat and rebellion cases. Soriano’s ruling was challenged by the DOJ before the CA. Last February, the CA — in a resolution issued by Associate Justices Sesinando E. Villon, Edwin D. Sorongon and Germano Francisco D. Legaspi – required Trillanes to comment on the DOJ petition. The DOJ, through Solicitor General Jose C. Calida, sought the reversal of Soriano’s ruling. Calida said the trial court erred “in holding that the judgment already attained finality and was, therefore immutable” and also “in admitting and giving credence to the Trillanes’ secondary evidence,” including the photo of his alleged acceptance of the amnesty. “The respondent judge could not have determined that Trillanes filed his amnesty application and admitted his guilt because the J1-AFP, the DND Records Division, the Office of the Undersecretary for Defense Affairs, and the trial court have no copies of the amnesty application,” he said.